From the whimsical and always wonderful world of Dr. Seuss comes Cats in Hats, Fish Red and Blue, and both kinds of Things - 1 and 2. And they're all coming to a Carnival cruise near you as the world of Dr. Seuss leaps off the page and onto Seuss at Sea. Dr. Seuss's timeless stories are the kind kids memorize, and this is the kind of cruise you'll remember for a lifetime. The whole family will still enjoy all the classic Carnival activities, but the littlest ones, and their families, will also enjoy an all-new, extra-special experience as the fantastical world of Dr. Seuss comes to life around them. Enjoy a special onboard character parade, interactive story time, arts & crafts activities, character breakfast featuring their favorite Dr. Seuss friends and more. 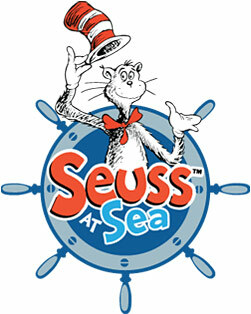 Seuss at Sea truly brings your child's favorite books to life. Let's use our imaginations - just think what would happen if we took a normal library and put it through one of Dr. Seuss's wacky contraptions… set to maximum fun, of course. It would probably come out looking much like Dr. Seuss Bookville, which as you can imagine, is exclusively aboard Carnival! The room is all decked out in bright colors, featuring fun and whimsical furniture and even has some of your all-time favorite Dr. Seuss characters on the walls. But let's not forget that this space is all about the books - the shelves are filled to the brim for hours of fun reading. Dr. Seuss Bookville is only available on Carnival Freedom, Carnival Horizon, Carnival Vista and Carnival Panorama. Stand up and cheer for the Seuss-a-palooza Parade, now streaming down the deck of select Carnival ships. Join characters you love - and a flock of your fellow fun followers - as you become part of the spirited procession of the biggest (and smallest) fans on this side of shore. This parade spreads the fun, so go spread the news… and to think that you'll do it on your Carnival cruise! Pack your imagination, but don't forget your appetite as the whole family embarks on a breakfast that's part meal, and part journey into the deliciously whimsical world of Dr. Seuss. Sit down to a truly fantastical feast at the Green Eggs and Ham Breakfast with The Cat in the Hat and Friends. Bright colors and patterns decorate your table, which features fun and unique menus. Feast! Feast! Feast! Lose yourself exploring a delicious menu where you'll find "Green Eggs and Ham," brightly colored fruit, gravity-defying pancake stacks, funky french toast, "Moose Juice" 'n' "Goose Juice"… and much more. (Classic breakfast offerings are available as well.) Breakfast is also the perfect time to meet and greet the stars of Dr. Seuss - characters will be around for special photo opportunities and fun interactions, making this a meal to remember. This event is for an additional cost.